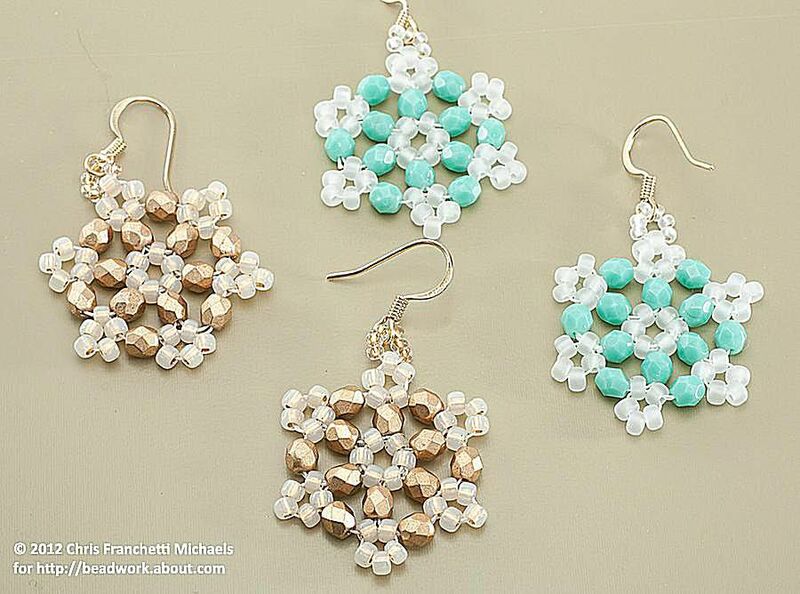 Use this beaded snowflake pattern to make a cute pair of winter earrings, a pendant or a small ornament. A completed snowflake measures about 1 ½ inches in diameter. 36 size 8 round Japanese seed beads. The sample snowflakes use Miyuki seed beads in yellow gold-lined opal. Twelve 4mm Czech fire polished faceted round beads. The gold colored earrings are matte metallic flax. Beading thread in a heavy weight such as 10 lb Fireline or Power Pro 30 pound test beading thread. Although you can use other threads and thread sizes, they may not give your snowflakes as much structure. A beading needle suitable for a thicker thread such as a big-eye needle or a collapsible-eye needle. The big-eye needles work well because they fit any size thread and the needle remains stiff. Findings. To make a pair of earrings, pick up a pair of ready-made French hook ear wires. To use your snowflakes as ornaments, use Christmas tree ornament hangers instead. © Chris Franchetti Michaels. The center ring of beads. Cut three feet of beading thread, and thread the needle for single-strand beadweaving. String six size 8 beads, and slide them down to about eight inches from the end of the thread. Pass the needle through the first bead again and cinch up the thread to create a ring. This will be the center ring of the snowflake. Once the center ring is created, you will be making a series of figure eights extending from the center loop. Position the center ring so that the working thread exits the ring in a counter-clockwise direction. String one 4 mm bead and five size 8 beads. Pass the needle through the first of the size 8 beads again to make a ring. When you do this, curl the beads around in a counter-clockwise direction. Hold the beads between your fingers to keep them in place as you make the stitch. Pull the thread taut so that you don't see any significant gaps between beads. The beaded loop that you just created is the first part of a beaded figure eight, which we will complete in the next step. © Chris Franchetti Michaels. The second loop in the first figure eight, made just to the left of the first loop. String one 4 mm bead, one size 8 bead, and another 4 mm bead. Pass the needle back into the center ring of beads, entering through the same bead that your thread originally exited when you began this figure eight. Pass through a second bead in the center ring. © Chris Franchetti Michaels. The first loop in the second figure eight. String one 4 mm bead and five size 8 beads, just like you did in Step 3. Curl the beads around counter-clockwise, and pass through the first size 8 bead again. Pull the thread taut. © Chris Franchetti Michaels. Completing the second loop. String one 4 mm bead. Pass down through the second size 8 and the 4 mm bead that you strung to begin the first figure eight, and up through the next two size 8 beads in the center ring. Pull the thread taut again. At this point, you can start to see the shape of the snowflake coming together. © Chris Franchetti Michaels. The third figure eight. You'll complete the next two figure eights using the same technique you used for the second one. String one 4mm bead, the five beads for the first loop, and then string a single 4mm bead to complete the second loop, which connects the new lobe of the snowflake with the previous one. The image next to this step shows the third figure eight completed. © Chris Franchetti Michaels. The fourth figure eight completed. Repeat to add another figure eight. The image next to this step shows what your beadwork should look like after completing the fourth figure eight of beads. © Chris Franchetti Michaels. The fifth figure eight completed. The image next to this step shows what your beadwork should look like after completing the fifth figure eight. © Chris Franchetti Michaels. How to begin the sixth, and final, figure eight. For the sixth, and final, figure eight, you need to stitch into the first figure eight to complete the circular snowflake. Begin by passing out through the 4mm bead from the very first figure eight, and then stringing four size 8 beads (these four are outlined in black in the image). Curl the beads around counter-clockwise, and then pass through the nearest size 8 bead in the first figure eight. © Chris Franchetti Michaels. Completing the last figure eight. Pass through the first of the size 8 beads that you strung in Step 10, and pull the thread taut. String a 4 mm bead. Pass down through the second size 8 that you picked up in the fifth figure eight, and down through the 4 mm bead in that loop, and back into the center ring. © Chris Franchetti Michaels. The thread positioned for the top loop. Sew through the snowflake and bring the thread out of a center size 8 bead in one of the outer loops. © Chris Franchetti Michaels. The top loop, for hanging the snowflake. String six size 11 beads, and then pass back through the bead that your thread exits, going in the opposite direction. This will form a small top loop for hanging the snowflake. © Chris Franchetti Michaels. A half-hitch knot being made. To weave in and end the threads, sew through a few beads in the snowflake, following the path of existing thread. Pull the thread taut, and then tie a half-hitch knot over the thread running between two beads. Pass the needle through the next bead, and tug the knot inside of that bead to hide it. Repeat this process a couple more times, and then trim off the thread close to the beadwork. Thread the needle onto the tail of thread that remains from when you started the snowflake, and use the same technique to weave-in and end that thread. © Chris Franchetti Michaels. How to attach an ear wire. Use the tips of chain nose pliers to gently bend open the ring on the ear wire to one side. Slide the top loop on the snowflake into the open ring. Use the pliers to gently close the ring again.